To win in an All-New Fire HD 8 Tablet, 8" HD Display, Wi-Fi, 16 GB (Black) - Includes Special Offers (RRP: £89.00), simply visit our Facebook page and like, share and comment ‘Cosyfeet’. 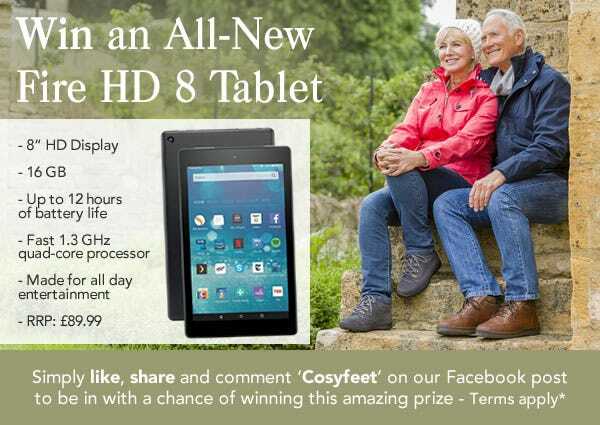 To be entered into the prize draw to win an All-New Fire HD 8 Tablet, 8" HD Display, Wi-Fi, 16 GB (Black) - Includes Special Offers (RRP: £89.00), simply visit our Facebook page and like, share and comment ‘Cosyfeet’ on our competition post. Note: You must complete all 3 actions (like, share and comment ‘Cosyfeet’) to qualify. Click here to visit our Facebook page. The closing date for entries is 11.59pm on the 28th February 2017. No entries will be accepted after this time. You will need to have a valid Amazon account to register and use this prize. One winner will be selected by random and will be notified by message on Facebook. The judge's decision is final. Prize cannot be exchanged for a cash alternative. By submitting an entry into our competition you are consenting to us featuring your name on our website and Facebook page. We reserve the right to withdraw this prize draw at any time. I have bought my shoes and socks from Cosyfeet for quite a number of years now because they are quality products and the only ones that I feel comfortable with being a diabetic and have to look after my feet.